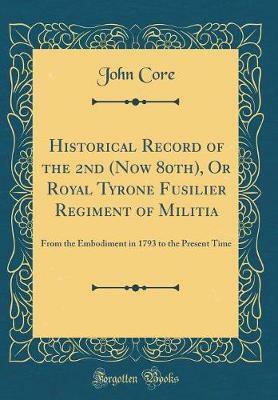 Excerpt from Historical Record of the 2nd (Now 80th), Or Royal Tyrone Fusilier Regiment of Militia: From the Embodiment in 1793 to the Present Time The toil that I have had in preparing this record will be amply repaid if I have succeeded in enlisting the interest of the reader in behalf of a regiment which was always second to none in loyalty, good conduct, and soldier-like appearance, and always foremost in readiness to serve the Crown and country. About the Publisher Forgotten Books publishes hundreds of thousands of rare and classic books. Find more at www.forgottenbooks.com This book is a reproduction of an important historical work. Forgotten Books uses state-of-the-art technology to digitally reconstruct the work, preserving the original format whilst repairing imperfections present in the aged copy. In rare cases, an imperfection in the original, such as a blemish or missing page, may be replicated in our edition. We do, however, repair the vast majority of imperfections successfully; any imperfections that remain are intentionally left to preserve the state of such historical works.